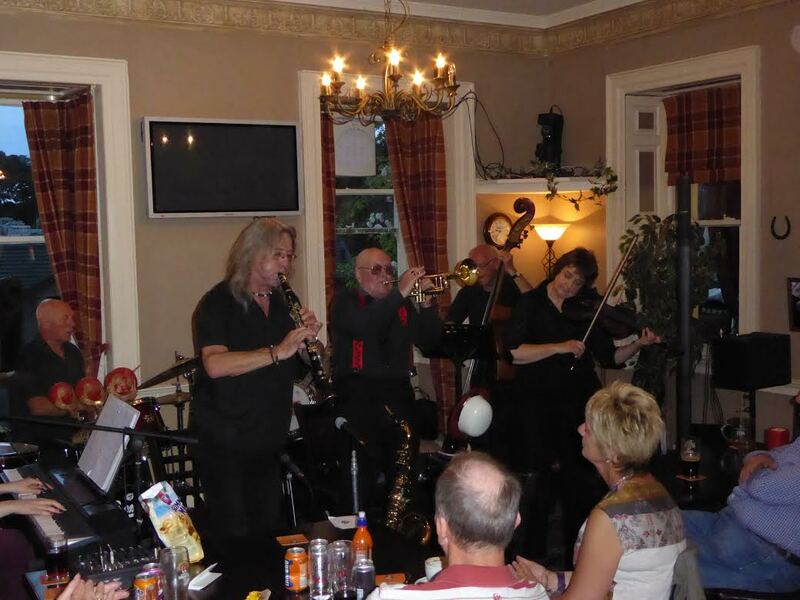 bebop spoken here: Tweed River Jazz Band @ Maguire's, Berwick upon Tweed - July 17. The Tweed River played an interesting programme, and as I do not pretend to be a New Orleans fan, I was delighted to find myself enjoying this so much. 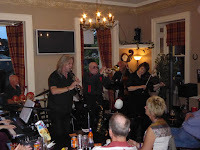 There are no weak links in the band despite the unusual instrumentation viz 81-year-old Peter Roughead on trumpet, tenor Sax and vocals; John Faragher on clarinet, Lucy Cowan on violin, Ruth Alder Bateman on piano and vocals, Brian Martin on Banjo, Brian Smith on double bass and Les Turnbull on grums. It worked well. I was a bit nonplussed about the violin but I was so wrong! What a player! I thought that I could hear a wee bit of a folk influence or maybe some gypsy jazz, whatever, the lovely melodic lines that she played worked well. Arriving, midway through the first set, the audience were already warmed up and calling out requests. Sweet Lorraine; I Want a Little Girl… This Love of Mine closed the first half and I had a chance to chat with Peter Roughead. He tells me that the band plays for their own enjoyment and for charity; they have raised £34,000 for the British Heart Foundation in the years since it was formed in 1985. He also told me about the man who came up to him in the interval a few weeks ago and said that he wanted to give £1000.00 for their collection. Peter told him to go away and think about it but sure enough the chap came back and that night’s collection went up by £1000.00; a big feature in the Berwick Advertiser followed. Peter spent years travelling backwards and forwards to New Orleans listening and playing with the city’s musicians. In 1988 he was made a Freeman of New Orleans. This dedication is overwhelmingly clear in his playing, clear incisive lead trumpet straight out of the Big Easy. The second set kicked off with Georgia on my Mind, and other highlights were High Society, Baby Face and a really nice song that was new to me - Louisiana Fairy-tale. Many of these tunes featured vocals either by Peter or by Ruth but it was hard to keep up as the hall was full and the audience making lots of happy noise! However the highlight of the set for me - and maybe everyone - was His Eye is on the Sparrow. A gospel song forever associated with Ethel Waters. Ruth sang unaccompanied through the first verse and then a long pause, audience now very quiet, until the band, guided in by the boss, made this a stunning performance. Baby Won’t You Please Come Home When the Saints go Marching in and then, almost as an afterthought, a very enthusiastically played Ice Cream! Have no idea where/when I last heard that! What a great ending. Looking forward to seeing them again. Brenda and I had a really happy night listening to a great band! PS They play somewhere every Sunday! Next week Beadnell.